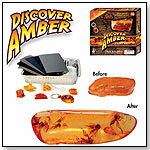 Polish real amber to reveal the hidden treasures that may be trapped within. Just like the paleontologists in the movie Jurassic Park, kids will create a window back in time. Follow the simple instructions and peer into the real amber pieces in search of ancient bugs and plants that were alive during the time of the dinosaurs. This fun activity kit contains 5 real pieces of amber, 6 special grades of gemstone quality sandpaper, magnifying glass, adventure booklet, and an amber-colored key chain with a genuine scorpion inside. Launch date: 2012. Squishable T-Rex by SQUISHABLE.COM INC.
Other products from SQUISHABLE.COM INC. This particular T-Rex is more adorable than it is scary. Squishables makes giant, round, fuzzy stuff animals. 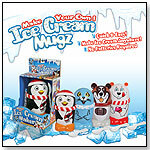 Aaron Glazer of Squishable.com, Inc, told TDmonthly that the T-Rex "wants only to cuddle and maybe nibble on your nose." Launch date: December 2009.